Many arguments are used to support vegetarianism – the health argument (a meat diet causes various diseases), the biological argument (humans are not naturally carnivorous), the economic argument (animal husbandry is an inefficient form of food production) and the humane argument (eating meat requires killing animals and this is cruel). Some of there arguments are very weak, others less so. But from the point of view of Buddhist ethics the only one of there arguments that has to be considered is the last one. Does the Pali Tipitaka, the earliest record of the Buddha’s teachings, contain anything suggesting that Buddhists should be vegetarian? There is no place in either the Sutta, the Vinaya or the Abhidhamma Pitikas where the Buddha says his disciples, monastic or lay, should not eat meat. There is one place, and to the best of my knowledge only one place, where he is described as eating meat. 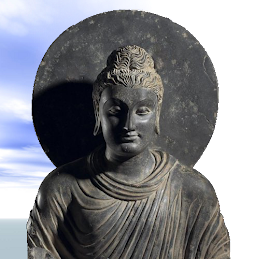 At A.III,49 it mentions that the Buddha was once served sukaramamsa with jujube fruit. This term can be translated with certainty as sukara = pig, mamsa = meat or flesh. 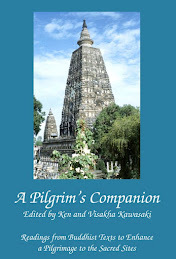 It is important to point out that the Tipitaka very rarely mentions what the Buddha ate, this not being its purpose. There are several places in the Vinaya where eating meat is mentioned or implied; e.g. where it is said particular types of meat should not be consumed (lion, snake, hyena, e.g. ), implying that other types can be (Vin.I,218-8); and where meat broth is recommended as a medicine (Vin.I,206). 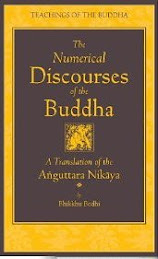 However, there is no doubt that much of the Vinaya dates from after the Buddha, some parts a considerable time after, and so it is reasonable to leave these references out of our discussion. 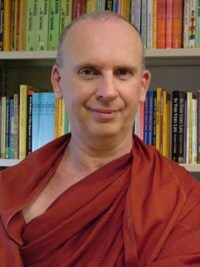 Advocates of Buddhist vegetarianism like Philip Kapelu Roshi have suggested that the Buddha did teach vegetarianism but that all such references were deleted by meat-loving monks in later centuries. There is no evidence whatsoever of this having been done and this argument can be dismissed out of hand. To sum up, vegetarianism was not taught by the Buddha and was not part of the earliest Buddhist tradition. The L ankavatara Sutra, a Mahayana work composed over four or five centuries, contains a list of arguments against meat eating. Several of there are compelling, most are rather weak and unfounded, e.g. you will smell bad if you eat meat. The next question is this – could vegetarianism be implied from or be more consistent with the Buddha’s teachings in general? The cardinal virtue of Buddhism is respect for life. This is embodied in the first Precept; not to harm living beings. I use the word ‘harm’ rather than killing because on many occasions the Buddha mentioned not just killing but also cruelty and violence as pertaining to the Precept. For example, he said that someone is unrighteous (adhamma) in body if they ‘kill living beings, are murderous, bloody-handed, given to blows and violence and without mercy’ (M.I,286). It is clear that to kill is to break the first Precept but so is pulling a cat’s tail, flogging a horse or punching someone in the face, although these actions would be less grave than killing. So this is the first point – (1) Killing or being cruel to living beings is against the first Precept. That true adherence to the Precept goes beyond the individuals’ direct physical involvement in harming or killing is clear from the Buddha’s instructions that someone who has takes the Dhamma seriously should ‘not kill, get others to kill or encourage killing’ (A.II,99). Here the Buddha says very clearly that I should take into account the indirect and even distant implications of my actions. So this is the second point – (2) Trying to influence and encourage others not to harm or kill living beings and to be kind to them would be consistent with the first Precept. As is often pointed out, the first Precept has two dimensions - avoiding harming on the one hand (varita) and nurturing, protecting and promoting life on the other (carita, M.III,46). This is expressed in the Buddha’s full explanation of the Precept when he said, ‘Avoiding the taking of life, he dwells refraining from taking life. Without either stick or sword he lives with care, kindness and compassion for living beings’ (D.I,). This is the third point – (3) Feeling and acting with kindness towards living beings is a part of the first Precept. The Buddha’s teachings of respect for life informs several of his other teachings, Right Livelihood (samma ajiva) being but one example of this. He gave as examples of wrong means of livelihood the selling (and/or manufacturing?) of weapons, human beings, flesh (mamsavanijja), alcohol and poisons (A.III,208).Although the Buddha does not specifically mention it, it is easy to see that the reason why these livelihoods are unethical is because they involve at some level harming or killing living things. So this is the forth point – (4) Not killing or harming living beings and being kind to them, is an integral part of the whole Dhamma, not just the first Precept. Another of the Buddha’s important teachings is that things do not come into existence randomly or through the will of a divine being but through a specific cause or causes. 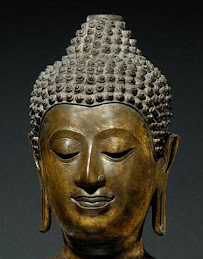 The most well-known example of this is wh ere the Buddha describes the things that give rise to suffering (DII,55.). However, there are other examples of dependent arising – the sequence of causes that give rise to enlightenment (S.I,29-32), to social conflict (Sn.862-77), etc. Using this same principle can clarify issues related to meat eating. Farmers do not raise cows or chickens for fun; they do it because they can make a living by selling them to the abattoirs. The abattoirs in turn sell their meat to the processors, who sell it to the local supermarkets or butchers who in turn sell it to the consumers. I think any reasonable person would agree that there is a direct and discernable casual link between the farmer or the abattoir and the consumer. It may be distant but it is there. Put in its simplest terms; abattoirs would not slaughter animals if people did not purchase meat. So this is the fifth point – (5) Eating meat is casually related to the harming or killing living beings and thus to the first Precept being broken. Now let us consider what the implications of these five points. Avoiding the complexities of the modern food processing and production industries for the time being, let us look at the simple version of it as it would have existed at the time of the Buddha and how it may still exits in some developing countries and perhaps even in some rural areas in the West. Let’s say that during the Buddha’s time some monks were invited to the house of a devote family for a meal and that they were served, amongst other things, meat. In accordance with the Buddha’s instructions in the Jivaka Sutta (M.II,369) they ate the meat because they had not seen, heard or even suspected that the hosts had gone to someone and specifically asked them to slaughter an animal so that it could be fed to the monks. While eating their meal these monks would have had no bloody intentions, no murderous anger, no perverse fascination in seeing a creature die. It is likely that they gave no thought whatsoever to where the meat came from or what was involved in procuring it. From the narrowest, most literal, strictly direct interpretation of it, the first Precept would not have been broken. But this narrow perspective raises, at least in my mind, quite a few troubling questions. (a) Firstly, as we have seen above, all the evidence shows the Buddha wanted the Precept to be interpreted in a board manner and to have all its implications taken into account. (b) Maybe the monks should have given some thought to implications and consequences of their actions. Did not the Buddha say, ‘Before, while doing and after having done a deed one should reflect, “Will this action lead to my own or others’ determent?”’ (M.I,416). (b) Although they may not have seen, heard or suspected that an animal was killed specifically for them, the monks must have been aware that it was killed for people who eat meat, and that they fall into this category. (c) Even if their role in the death of a creature is only indirect and distant, genuine metta would urge one not to be involved in killing even to that extent. The Buddha said that we should ‘develop an unbounded mind towards all beings and love to all the world. One should develop an unbounded mind, above, below and across, without obstruction…’(Sn.149-50). Saying ‘It wasn’t killed specifically for me and while I ate it my mind was filled with love’ sounds like erecting an ‘obstruction’ to genuine love, it sounds like restricting love within a boundary. The conclusions of all this seems to me to be inescapable – that intelligent, mature Dhamma practice requires vegetarianism. Tomorrow I will continue on this theme and look forward to your comments. Thank you for this article, I have a confession to make I eat fish and eggs and very occasionally meat. It has made me reconsider my position on what I consume. Isn't it a fact that the cultivation of arable crops kills insects in there production so you can't win either way. We should take this rare oppurtunity to practice vipassana meditation and get release from all suffering so best to make use of this precious human rebirth. I don't know if I would call some of the biological, health, and environmental arguments weak, but when compared to your most excellent five points, maybe they are! In regard to the three-fold rule, I have always wondered why a monk could refuse alcohol placed in the bowl, could refuse tiger meat placed in the bowl, but not meat from chickens, pigs, and cows. As long as a monk is allowed to refuse some things, why not other unwholesome things? Wow, nice post, I realise how unintelligent and immature I am! You made some incredibly powerful arguments that made more firm my own conviction to vegetarianism. I do, however, have a question pertaining to monks being allowed meat that they hadn't seen, heard or suspected had been killed for them. It seems that it may be construed as a tacit endorsement of killing, and, done with a blank mind may be a dull one. However, if one is offered food by people who don't understand the Dhamma as they should, but just know that you offer food to monks, then wouldn't it give them a sour opinion of monks if they refuse food that they householder sees as perfectly good? Might this cause people who would be drawn to the Dhamma to turn away after their offering was "spurned"? I do hold that vegetarianism should be the standard, if only because people just "intuit" this as a "holy" way of being and justification is needed to support its abandonment, but I have run into situations where I know a meat additive was in a particular food offered me, and, so that I didn't create enmity, I took the food. Thank you for this incredibly clear post! Vegetarians probably tread "lighter" - not necessarily in a physical sense, but ideologically. Is that because we don't bear the tremendous burden of having consumed something that once was ALIVE? Every other merit follows; i'd start with the sheer lightness of being. I have being a vegetarian for past 2 years after seeing a photo of a lamb being slaughter. since then I have ponder on why people choose to eat meat. Here are some of my thoughts. They are more or less related. Usually people who eat meat do not have craving to kill. Rather they just have the craving to eat meat. This desire makes them forget that a life is actually being sacrifice for their few minutes of enjoyment. Most people are more concern about their own toothache than about thousands of victims crushed under the debris during a earthquake. 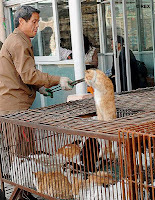 Thus they fail to realise the pain that animals went through when they are having their neck slit. Their craving sort of 'blind' them to these images. There is also a 'If I can't win them, join them ' mindcept. People who don't become vegetarian tends to think : even if I stop eating meat now, animals will still be killed everyday, what difference will I make? Most people thinks that if you are kind hearted, there is no need for you to become a vegetarian except mayb on special occasions. You only need to become a vegetarian if you want to 'make atonement' for sins or if you are a really sinful person. Again, I felt it is just some excuse meat lover give to themselves. They jus won't admit they are craving for the big mac. These are just some of my thoughts. But I would like to thank you for the insightful entry. It has really provide some points that I have not thought about myself. I will be looking forward to your part 2. A Big Mac! The thought of that is enough to put me of food altogether! Thanks for your interesting comments. This is very well-reasoned. Unfortunately the argument normally gets bogged down in such issues as scriptural authority, without getting to the heart of the scriptural message, which is what you have just done. When we eat crops directly, it is not true that more insects have to die - because the crops that meat animals consume is much more - which involves even more deaths of insects. One can also choose to lead an organic way of life. So in terms of food - none is without sin! they transcend all stress & suffering."